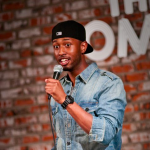 James Davis is hilarious and arguably one of the hottest new comedians. 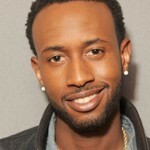 His fresh face in Hollywood earned him a spot on BET’s REAL HUSBANDS OF HOLLYWOOD as Oliver with Kevin Hart. James has appeared in Hell Date, Russell Simmons Presents Stand Up, Pit Boss and written for the last six BET Awards and last five BET Hip Hop Awards. James is not only winning fans on stage and screen; he’s winning fans on the internet as well. His parody Baracka Flacka Flames – Head of the State was named #2 viral video of 2010 by AOL and has over 10 million views on the web. The popular spoof even landed James on Inside Edition and The New York Times. Since then, James has released numerous viral sketches on YouTube and become a regular on Will Ferrell’s Funny Or Die website where he gained notoriety for his Kobe Bryant Parodies. James recently has become a regular on the E! channel’s Chelsea Lately, has a re-occuring role on BET’s Real Husbands of Hollywood, and will appear in the return of Nick Cannon’s Wildn Out and Lil Duval’s “Ain’t That America” on MTV 2 this summer.